CORNER BROOK, N.L. — It’s a pretty basic strategy for Jacob Hersikorn’s Saskatchewan team of late at the 2015 M&M Meat Shops Canadian Junior Curling Championships. Saskatchewan fans, including members of the Kristen Streifel women’s team, cheer on Jacob Hersikorn’s team during the men’s semifinal on Sunday. Just leave the 20-year-old University of Saskatchewan student a double-takeout with his last shot of the game, and he’s going to make it. For the second straight backs-to-the-wall occasion, Hersikorn delivered the goods in the clutch, removing a pair of Team New Brunswick counters with the game’s final stone to lead Saskatchewan to an 8-6 men’s semifinal win and into tonight’s gold-medal game at 8 p.m. NST/6:30 p.m. EST on TSN/RDS2 against defending champion Braden Calvert of Manitoba at the Corner Brook Civic Centre. Never more so than Sunday afternoon when, after missing his last-rock takeout in the ninth end to set New Brunswick up for a game-tying deuce (it was actually a shot at three but New Brunswick skip Rene Comeau, the 2014 silver-medallist, rolled out of the rings on his hit attempt), Hersikorn settled himself down to navigate the pivotal 10th end. And, for the second straight game (he made a double-takeout to win Saturday’s third-place tiebreaker against Quebec’s Félix Asselin), he delivered the goods. 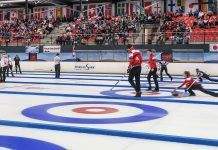 Tonight’s winner will represent Canada at the 2015 World Junior Championships, beginning Feb. 28 in Tallinn, Estonia. Tenetuik said the work of front-end sweepers Brady Kendel and Brandon Leippi (the team is coached by Laurie Burrows) was pivotal on the winning shot. Saskatchewan will be bidding to win its first Canadian junior men’s crown since Braeden Moskowy prevailed in 2011 at Calgary; Saskatchewan has won 15 previous Canadian junior men’s championships. In Hersikorn’s way is Calvert’s defending champion team from Winnipeg, which is aiming to give Manitoba its third straight win at the M&M Meat Shops Canadian Juniors, and 11th overall. Meanwhile, Kelsey Rocque’s team from Edmonton, which won the women’s gold medal on Saturday night, announced its alternate for the 2015 World Juniors. Rocque’s team — third Danielle Schmiemann, second Holly Jamieson, lead Jessica Iles and coach Amanda-Dawn Coderre — will be rounded out by Saskatoon’s Kristen Streifel, who skipped Team Saskatchewan at the 2015 M&M Meat Shops Canadian Juniors.